Your #1 Choice for Reliable & Qualified Sanitary Services! King's Sanitary Service continuously strives to provide our customers with the most comprehensive sanitation services in Trumbull, Mahoning, Portage, Geauga, and Ashtabula Counties. As a NFIB certified business we provide our valued customers with the highest quality service available. Tired of having to dig up your yard every time you need your septic tank pumped out for service? 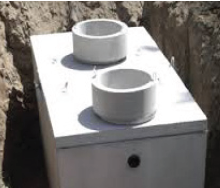 Sounds like you are in need of septic tank risers to bring your access to ground level! Our septic tank risers and covers are made from high quality, heavy duty polyethylene plastic which makes them very strong and durable while also allowing them to be easy to handle. 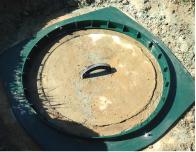 Did you know that having septic tank risers help keep septic pumping prices down? By having a septic tank riser, you are making the tank accessible from ground level and eliminates the time it takes to dig up the lid, saving the homeowner time and money. Eliminates having to search for the septic tank. Easy access in order to clean and maintain plumbing & components.